Following on from my comments on another page, I had a look through the archives at the Museum, where there are a couple of books dedicated to the RAF station and the 'crash boats', as they were so often called. Their history is already covered, but here are a few photos of what I think may have been the last craft to be stationed here. 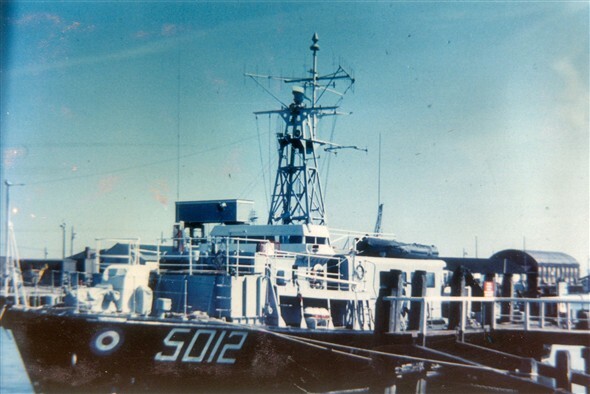 5012 was a former Royal Navy Ham class minesweeper. I've heard her described as HMS Watchful but can find no record of her under that name. According to the museum files, she was loaned to the RAF as a floating 'testbed' for their boffins to use. It doesn't say what the boffins were up to and I guess we'll never know (a bit like the Army's Colonel Templer moored on the opposite side of the river). The two photos here show her before and after a major refit to her accomodation and bridge. There were many of the 63' pinnaces stationed here over the years. I can remember 1380, 1390 and 1392 and, as the photos show, 1389 may well have been the last. Newhaven Museum also has photos of a pinnace and lifeboat holding a joint Remembrance Sunday service in Seaford bay. 5012 and 1389 - the final pairing? This page was added by Andy Gilbert on 12/02/2009. Pictures 1,2, and 4, show the converted Ham class inshore minesweeper as she was during RAF marine craft section use. 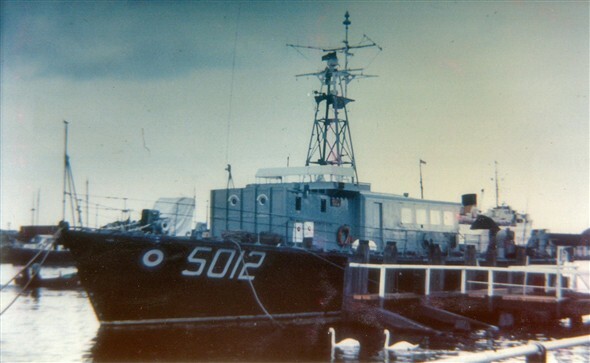 I remember either this vessel or another of this type being berthed adjacent to these jetty moorings prior to or just post RAF use, and the vessel was either modified and possibly renamed "R.G.Masters". When this craft was involved with RAE (Royal Aircraft Establishment ) I believe it was carrying out research in conjunction with sonar buoy testing. if anyone knows to the contrary please feel free to enlighten me further . Nice pictures showing this late period or RAF marine craft at these moorings. R G Masters rings a bell, Chris. Not sure if that was 5012 though. I seem to recall black hull, white superstructure and a buff lattice mast. It was a long time ago, but I'll have a dig around in the archives to see if I can find a photo. 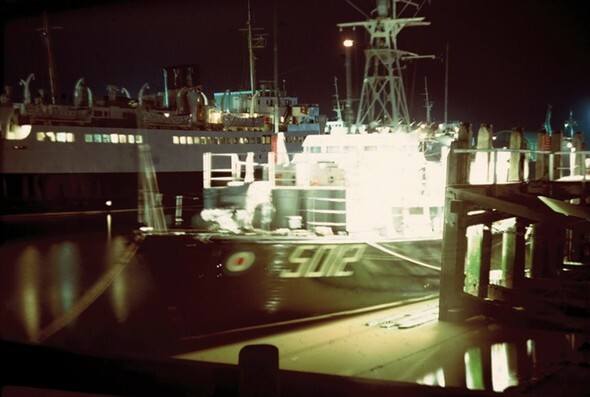 IRV (Interim Recovery Vessel) 5012 (on charge 1966) was ex HMS Halsham M2633, completed in 1954. She was transferred to RCT in 1972 and re-named RG Masters VC. RAF Marine Craft Directory Vol I.
Chris, thanks for reminding me that IRV 5012 was involved with the RAE (Royal Aircraft Establishment), I have previously stated on another posting that we were involved with the 'Ministry of Technology', whether they were one and the same thing I don't recall. You are 100% right that the work was to carry out research in conjunction with sonar buoy testing. In fact the explosives we used provided the mess with fresh fish on a regular basis! The major refit shown in the before and after pictures was to install a 'flume' tank (seen just forward of the bridge superstructure) to try to counteract the notorious roll that the vessel had. I did many a sea passage on her and can vouch from first hand experience that she 'rolled like a pig'. I can remember on one voyage rounding Lands End returning from Holyhead and wondering how we managed to stay upright. Happy Days! I thought HMS Watchful was one of the larger type minesweepers similar to the one that Mike Smith purchased. If one looks at the page headed "The last launch in 1959" at photo 5, you will see the type of craft I believed it to be. The one against the quay may even be HMS Watchful, as it would have been the right period of time. Have just found your page re the RAF air sea rescue boats. Back in 1962 I was part of a team from the REU at RAF Henlow that canoed across the channel from Calais to Dover and we were accompanied by 1390. Somewhere in my archives I have photos taken on board and also a copy of a French newspaper report of 1390 and its crew putting into Calais overnight. I must look them up. Glad to see that 1390 and it's sister boats are still remembered. 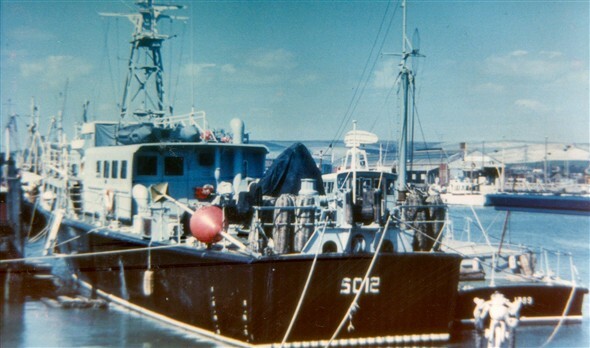 When I joined the marine craft section at Mountbatten in late 1966 this boat was at Newhaven and two more were based at Mountbatten Plymouth.Apparently the boffins used to get sick as the Hams would roll on wet grass. They devised a system of a parachute affair hung inverted either side to damp the motion down. Unfortunately they did not allow for the tide sweeping under the hull!!! I was put on 5001 while awaiting a course and my first job was to make the tea which I did pumping water from the lovely brass pump in the galley! Much to my amazement people started spitting my lovely tea out. The pump was salt water for washing up!!! 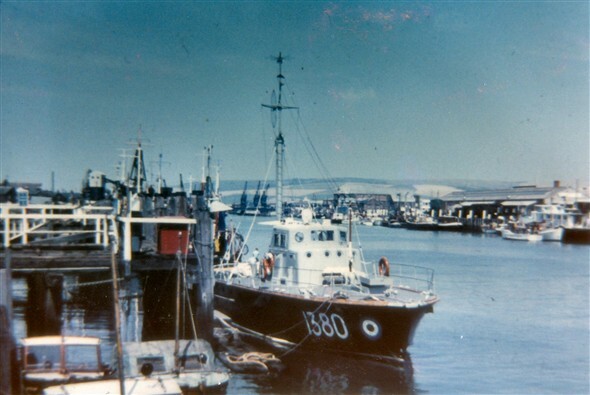 There is a good photo, ©, of 1390 on the Ships Nostalgia website at, http://www.shipsnostalgia.com/gallery/showphoto.php/photo/306817/title/raf-1390/cat/all However you need to register, with Ships Nostalgia to see the photos. Registering is free and easy enough. Just left a comment on that site, Pete. Well worth registering! Andy - Editor. I remember 5012 well, I was on her for two and a half years Sept. 1969 to Mar 1972. The flume tank worked very well. 35 degree roll down to 11 not under way, you had to empty the tank before getting under way.